Dubai International Airport (DXB) retained its position as the world’s busiest airport for international customer numbers for the fifth consecutive year with annual traffic for 2018 surpassing 89.1 million, according to the annual traffic report issued by operator Dubai Airports today. Passenger traffic increased one per cent last year, operator Dubai Airports said. The 8-million customer mark was breached twice during the year, in July (8.2 million) and August (8.4 million), making the latter the busiest month in DXB’s 58-year history. India continued to hold to its position as DXB’s top destination country by passenger numbers, with traffic for the year reaching 12,279,485 – propelled mainly by top city destinations Mumbai, Delhi and Cochin. Saudi Arabia was number two on the list with 6,471,142 customers, followed closely by the UK with 6,284,771 customers. Other destination countries of note include the US (3,205,524 customers) and the fast-growing markets of China (3,512,075) with 6 per cent growth and Russia (1,533,654) which grew 14.5 per cent. Eastern Europe was the fastest growing region with double-digit growth of 16.7 per cent, followed by CIS at 12.9 per cent and Africa growing 9.8 per cent. Flight movements for the year remained almost flat at 408,251 (down 0.3 per cent), while the average number of customers per flight grew slightly to 226 (1.3 per cent) annually. 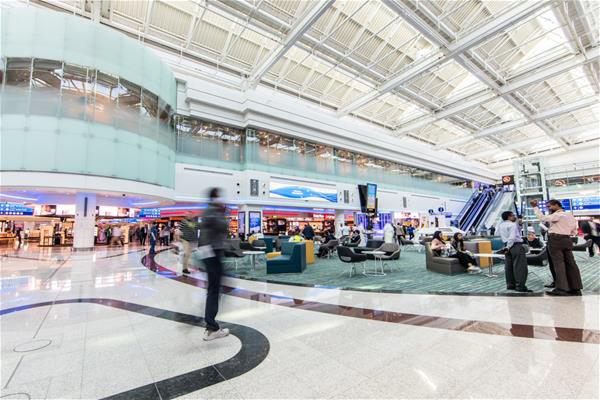 Wait times were reduced by 28 per cent in 2018, thanks to DXB’s advanced operations centre which uses real-time information to improve service and efficiency, as well as the smart gates that help speed customers through immigration. A total of 2,641,383 tonnes of airfreight was handled at DXB (down 0.5 per cent) during 2018.